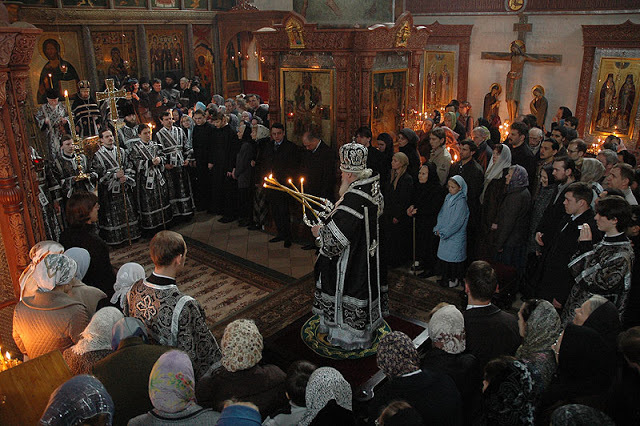 As this Divine Liturgy (really Vespers with the communing of the faithful) is served only on weekdays during Great Lent, prostrations are done by the faithful at various parts of the service. This little pamphlet is designed to help you understand when prostrations are done, as well as explain a few of the interesting anomalies of this Divine Service. – Prostrations are done when you enter the Church. Rather than just crossing yourself three times when entering you in fact cross yourself and prostrate yourself to the ground three times upon entering. – When lighting candles and kissing the icons prostrations are done as well. Two prostrations following by the kissing of the icon, the placing of your candle, and finally a third prostration before the icon. – When the curtain is closed (following the third Small Ektenia), all the faithful (except for the one person reading the psalms) prostrate themselves to the ground. They do not arise until the curtain has again been opened. – After the first reading from the Old Testament the priest opens the Royal Doors and says “The Light of Christ Enlightens All!” As he blesses the faithful with the candle the faithful (including the Reader) make a prostration to the ground. 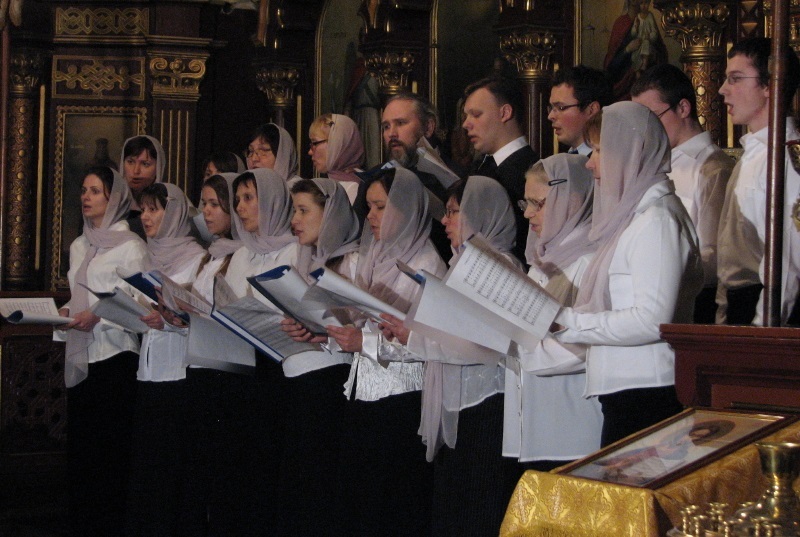 – During the singing of “Let my prayer arise…” the faithful and the singers prostrate themselves. The faithful prostrate themselves while the TRIO is singing (in some parishes the trio actually sings in the middle of the church on its knees). The trio prostrates itself while the CLERGY are singing. The people stand while the clergy are singing. – During the two readings of the Prayer of St. Ephraim the Syrian (after “Let my prayer arise…” and after the Great Entrance) the faithful prostrate themselves as does the priest. – When the Holy Gifts are brought out of the altar for the Communion of the faithful and the priest says “With the fear of God and faith draw near!” the faithful prostrate themselves. – After the Communion of the faithful, when the priest again brings out the Holy Gifts and says “Always, now and ever, and unto the ages of ages!” the faithful prostrate themselves. 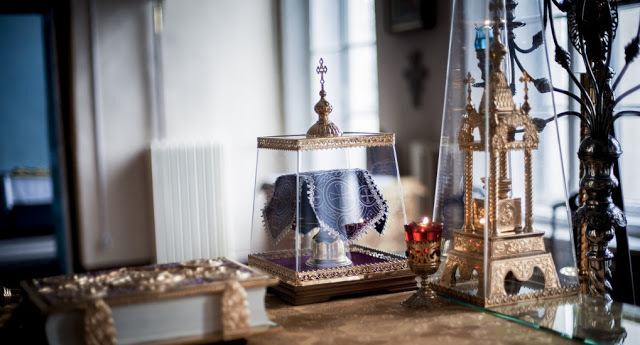 – If the Presanctified Liturgy is served on any day but Friday the faithful do three prostrations as they exit the church (except for those who have communed). If it is Friday we cross ourselves three times as usual, without prostrations. 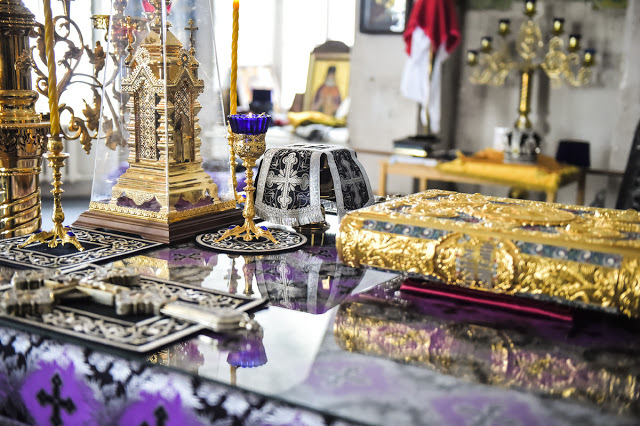 The question, of course, arises as to why we are doing so many prostrations at the Divine Liturgy of the Presanctified Gifts. As we usually attend church services on Saturday nights and Sunday mornings when prostrations are forbidden, we feel a bit odd prostrating ourselves on the floor in the Church. However, we do prostrations on almost all days throughout the year except on Sundays. 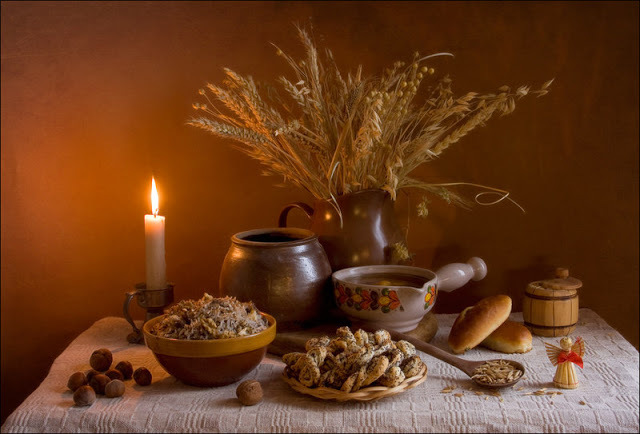 When we prostrate ourselves before the Holy Gifts we express our belief that the Holy Bread and the Holy Wine are truly the Body and Blood of our Lord Jesus Christ. That is, we bow down before God Himself. 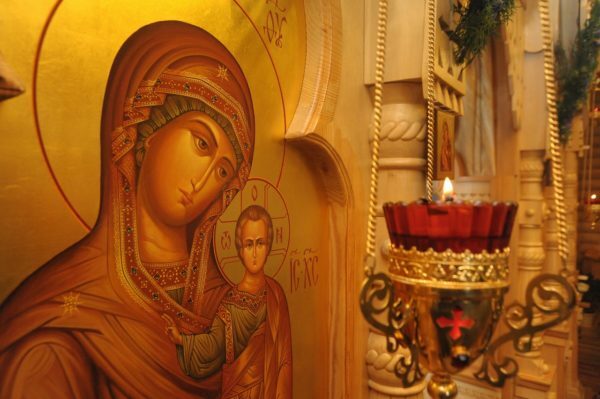 -There is no prosphora offered at the Presanctified Liturgy. As there is no consecration of the Body and Blood of Christ at this service (the Gifts were PRESANCTIFIED at the Liturgy on Sunday), there is no prosphora offered. – Infants who do not eat solid foods do no commune at this service according to the ancient tradition of the Church. There is a long explanation to this practice. Please see Fr. Gregory if you would like to learn more. – The cross is not held by the priest following the service. Again, this is an ancient practice of the Church and reminds us of the penitential character of Great Lent. 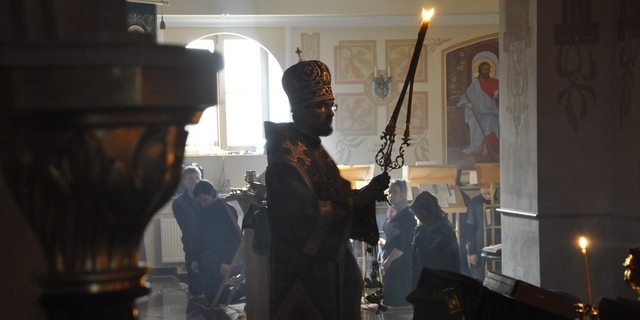 – The priest commemorates the saints from both the day of the Presanctified Liturgy and the day following, since the Liturgy is actually a Vespers service and it encompasses aspects of both days. To make a prostration we make the sign of the cross on ourselves, kneel, place our hands on the floor and touch our foreheads down between our hands. after lightly touching the head to the floor. It takes very little practice to master this technique, which requires surprisingly little physical stamina. The segment from How to Make a Prostration by Frederica Mathewes-Green is especially wonderful—"One former Episcopal priest said that seeing people prostrate themselves was one of the things that made him most eager to become Orthodox. He thought, "That's how we should be before God." That is exactly the way I felt at my first Pre-sanctified Liturgy! I knew that that was how I wanted to worship God!